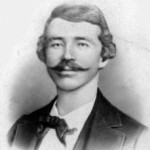 Born in Ohio, William Clarke Quantrill (July 31, 1837-June 6, 1865) failed as a school teacher, and drifted into Lawrence, Kansas, a pro-abolitionist center. Since he rode with both the abolitionist Jayhawkers and the pro-slavery Border Ruffians, while claiming to be spying on the other side, neither side fully trusted him. After betraying five idealistic abolitionists on a raid to liberate slaves in Missouri he became a hero but barely escaped a lynching in Lawrence. The American Civil War (1865-1865) started soon after and Missouri came under Union control, so Quantrill became a guerrilla, and was leading his own guerrilla band by late December 1861, attracting numerous recruits including Cole Younger and Frank and Jesse James. Although he was the alpha guerrilla in Missouri during 1862, the men had divided into smaller bands led by his former lieutenants George Todd, Dave Pool, Bill Anderson and Younger by the spring of 1863. The accidental death of several female relatives of guerrillas while in Union custody was used to persuade all of the guerrilla leaders to combine for a raid against Lawrence on August 21, 1863. The massacre of 185 unarmed men and boys triggered a massive manhunt by Union forces, so Quantrill led his remaining followers to Kentucky in search of easier pickings. However, Quantrill was captured on May 10, and he died in a Union hospital on June 6, 1865. Describing himself as a former Union officer and horse trader, a stranger (Steve Cochran) helps a Union army convoy escape an ambush by William Quantrill’s guerrillas. However, he is actually Captain Alan Westcott, a Confederate officer, who wants a pass to cross Union lines in order to tell Quantrill (Leo Gordon) that he is ordered to attack the federal arsenal at Lawrence, Kansas in support of General Sterling Price’s planned invasion of Missouri. While scouting out the town in preparation for the raid, Westcott falls in love with Sue Walters (Diane Brewster), who runs a boarding house. When the weapons are moved to a different location away from the town, Quantrill decides to continue with the raid, desiring revenge for his previous treatment in Lawrence. However, Westcott has a change of heart and races to warn the town. 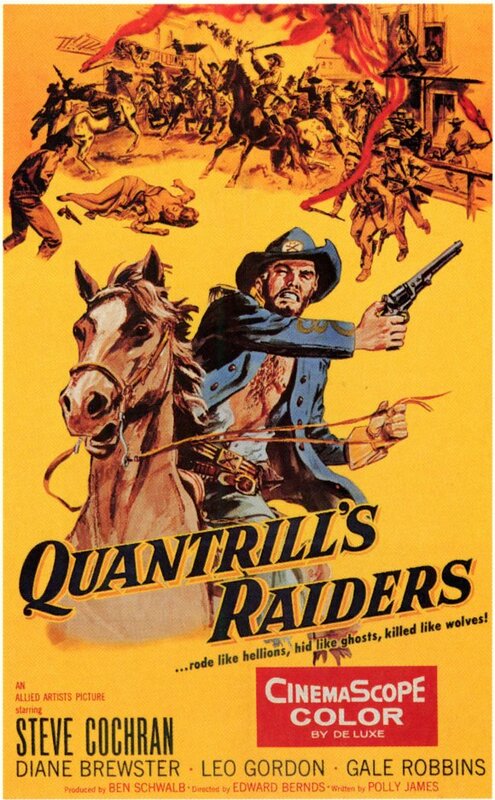 The movie opens with the statement “In the dark days of the Civil War, William Quantrill’s guerrillas looted on both sides of the Missouri-Kansas border, but many Confederate officers viewed him as an outlaw,” which is a good description of Quantrill. The screen Quantrill had lived in Lawrence before the war, under the identity of Charley Hart, a popular school teacher. Planning to betray a group of young men who were planning to help slaves from a farm in Missouri escape to Kansas, Hart feared that he had been discovered, so he shot all three men in cold blood in Lawrence. Admittedly, Quantrill had been a teacher and he called himself Charley Hart while living in Lawrence, but he did not teach in Lawrence. Instead, he hung out with a group of thugs called the Border Ruffians, who raided both sides of the Missouri-Kansas border for profit. Five idealistic abolitionists wanted help on a raid deep in Missouri, and Quantrill persuaded them to attack a slave owner who lived near the border even though a more experienced abolitionist urged them not to trust him. This was good advice since Quantrill betrayed them to the owners of the slaves. Two of the abolitionists were killed and Quantrill himself finished off a wounded survivor to prevent him from informing on him. Treated as a hero in Missouri, Quantrill eventually became bored, so he returned to Lawrence, where he was nearly lynched, which explains his hatred of the town. Although a large force of guerrillas led by Quantrill did attack Lawrence on August 18, 1863, almost everything else in the story is either made up or altered to fit the needs of the script. There was no federal arsenal at Lawrence, and while Sterling Price did launch a failed invasion of Missouri, it took place roughly a year after the raid on Lawrence. There is a surprisingly large cloak and dagger element in the movie, but the entire purpose of Westcott’s mission is nonsensical. Essentially the Confederate army smuggled an agent across Union lines, and he travelled across several northern states to reach Lawrence, Kansas, where he used pre-arranged signs and countersigns to contact a Confederate agent, in order to make his way back across Union lines to deliver an order to Quantrill. Since Missouri bordered several states in the Confederacy, the Confederate army had relatively regular contact with Quantrill and the other guerrilla leaders. The problem was not communication, but the preference of the various guerrilla leaders to pursue their own objectives, rather than strategy set by the Confederate army HQ. The real raid on Lawrence involved 400 men, but that was probably too much for the movie’s budget, so the screen Quantrill leads less than fifty men to attack Lawrence. 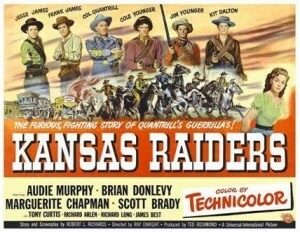 Although it is one of the least of the movie’s problems, the age of the screen Quantrill’s followers is incorrect. Unlike the middle-aged actors, only young men in their early twenties could handle the hardship of the guerrilla lifestyle. Most important, the script ignores the actual reason for the attack on Lawrence. Quantrill had been the dominant guerrilla in Missouri during the early stages of the Civil War, but his former subordinates George Todd, Bloody Bill Anderson, Dave Pool and Cole Younger had formed their own bands by the spring of 1863. Resentful that he had been pushed aside, Quantrill became depressed and spent most of his time with his fifteen-year-old mistress Kate King. When the building housing seventeen Missouri women who had been arrested as Confederate spies collapsed in Kansas on August 14, 1863, killing five and badly wounding the rest, Quantrill knew that he had an opportunity to regain the spotlight. Since several of the dead women were related to Younger and Anderson, Quantrill convinced all of the guerrilla leaders to launch a massive raid against Lawrence even though a recently constructed series of outposts along the Missouri-Kansas border meant that it would be almost impossible to cross the border undetected. An outpost commander lacked diligence, so the was taken by surprise and the 450 raiders then rode through the town killing any male old enough to hold a gun. When the guerrillas rode out four hours later, 185 men and boys were lying dead on the ground, while the town had been looted and torched. 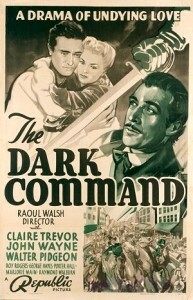 The massacre was greeted with fury in the north and disgust in large parts of the south, but the only people massacred in the film are guerrillas. The only interesting part in the movie is Westcott’s relationship with the two love interests. Quantrill’s mistress Kate (Gale Robbins) immediately falls for the stranger and they have a romantic interlude where she tries to give him a reason to take her away from the band. Even though he was already smitten with the boarding house owner, he still succumbs to the bad girl’s more direct approach. Since it is a B-movie, there is not enough time for a proper courtship, so Westcott and Walters have fallen in love and are making plans for a future the day after they meet. That’s why she is the good girl, she waited a day, and she let him make the move. Logic does not go far in the film. Westcott rides into town wearing the exact same clothes that he had worn when he had rescued Quantrill’s second-in-command George Todd from the vigilance committee a couple of hours earlier, believing that pulling his bandana over his mouth was sufficient disguise. Admittedly, many outlaws used a bandana to conceal their identities when robbing banks or stagecoaches, but they usually picked areas where they were not well-known and did not walk back into the bank a few minutes later wearing the same clothes with the bandana pulled down. Even Superman changed clothes, instead of simply relying on taking off his classes. Westcott is suspected of being a spy because he obviously is a spy, an incredibly bad one. It is very silly and a little boring. A perfect example of the mediocrity of far too many B-movies, it sets a new standard in changing the facts. Once again I love the historical background. Great job. I like Westerns (I would classify this movie as being best placed in that genre), but I find they are usually even more historically inaccurate than your average war movie. Especially before the revisionism of the 1970s. I thought you might mention “Ride With the Devil” in your post. A great example of the improvements in this genre. And a great example of the difference between a B-movie and an A-movie. Thanks, glad you enjoyed the historical background. You are right that this is an excellent example of B movies at their worst, but some B movies are surprisingly good, especially westerns, because they are not weighed down by bloated casts. This was not one of them.